Who should take the French Placement Test? Students who want to register for the first time in a French Studies course at the University of Winnipeg. Yes, students with no French or very little French are not required to take the test. These students should contact Rachel Berg at r.berg@uwinnipeg.ca, with their student name and number, describe their previous French experience (ex. Up to what grade in Elementary, Junior High or High School did you complete French? ), and indicate which course they wish to register in. Upon confirmation from the department, these students will be issued a petition to enroll in FREN-1100 without taking the placement test. No, the test is free of charge. The purpose of the Placement Test is to determine which first French language course is best suited to your needs. Therefore, you are expected to write the test on your own, without the help of documents or another person. It is in your best interest to do so in order to be placed in the course suitable to your level, to avoid failing a course, or to avoid taking unnecessary courses. Your test score indicates your level of proficiency in French language skills and will give you permission to register for a specific course. You cannot pass or fail this test. Your test score and answers will be available to the department and your instructor. After being accepted for admission to the University of Winnipeg and prior to registration. You need acceptance status to access the test. Once accepted at the University, you will have received a letter with your UW WebAdvisor account details. This University assigned WebAdvisor username, password, and your UW Student Number are necessary to sign up for the test. What are the dates when the test is available? The test is currently closed, and will re-open in the spring. 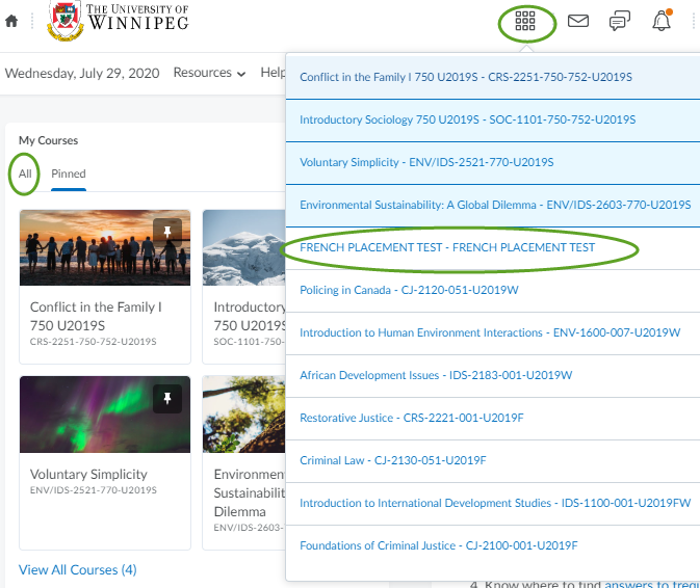 Once you have been added to the test site, you will receive a confirmation email within 1 working day saying that you have been enrolled in the French Placement Test site. This email will be sent to your UW webmail address. Once you have received this confirmation email, you can log on to Nexus and take the test at your convenience. If you haven't received a confirmation email within 2 working days, please log on to Nexus and check to see if the test has been added. If you still cannot see the test in your Nexus account, contact Rachel Berg at r.berg@uwinnipeg.ca for further guidance. Use your WebAdvisor username and password to log on to Nexus. Once you have logged on, you will see an image and a link to the test under “My Courses” on the left. If you do not see it, make sure to click the Course Selector and search for the course. Click on the words “FRENCH PLACEMENT TEST” or the course image to enter the test course site. Test instructions are listed there. I’ve never used Nexus before. I need help. Click the Help button to view links to instructions on how to navigate in Nexus. You have 50 minutes to complete the test. The test will automatically end 50 minutes after you begin. You may take the test only once. How and when do I receive the results of the test? Your results will be sent out by email to your Nexus account (NOT your webmail, but the inbox in Nexus itself) within 24 hours of completing the test. If you have not received an answer within 48 hours, please contact Rachel Berg at r.berg@uwinnipeg.ca. The results from your test will be placed in your student account within 2 working days from when you receive the email. The email you receive will specify which course you are allowed to register in. Make sure that you register in the correct course and corresponding lab in Student Planning/WebAdvisor. If you were given the option between two levels, consult the course descriptions and choose the level you feel most confident in attempting. If you have any questions, contact Rachel at r.berg@uwinnipeg.ca for further guidance. Print a copy of the email. It will be requested by your instructor at the beginning of class. You will also need it to register if you do not register online. PLEASE NOTE: The results of your test will be forwarded to the Department of Modern Languages & Literatures. If the department discovers that you have registered in the incorrect course, you will be asked to re-register in the appropriate level.